If you haven’t been to Tampa International Airport much, the airport has gone through a metamorphosis and it is now, well, really awesome. The biggest change has been in the sheer amount of great places to eat no matter what terminal you are chilling in before your flight. So, here is a little trivia on eight things you might not know about TPA for next time you fly. Inside TPA, 40% of all concessions are local. This way visitors from all over the world can get a little flavor of the great things happening in our area. 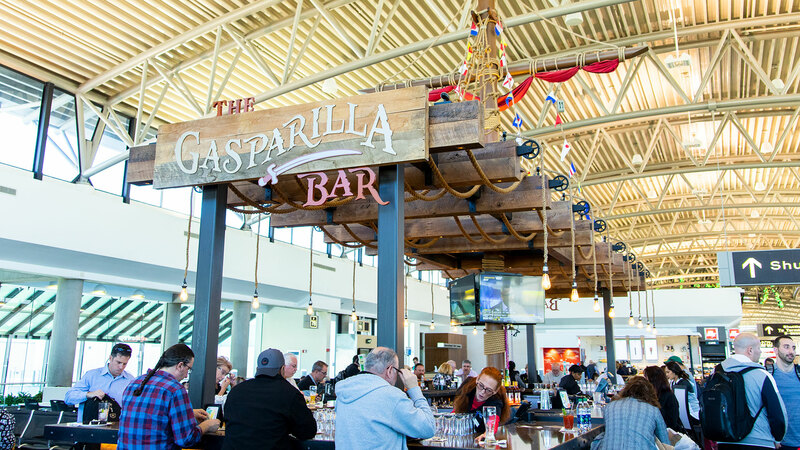 Inside the airport you will find fresh coffee from local favorites Kahwa Coffee and Buddy Brew, char-grilled oysters from Ulele and burger and fries from Goody Goody. Of course, don’t forget about the cafe spin-off of the Tampa classic restaurant Mise en Place which serves modern American cuisine along with another one of Tampa’s best, the Irish pub, Four Green Fields. 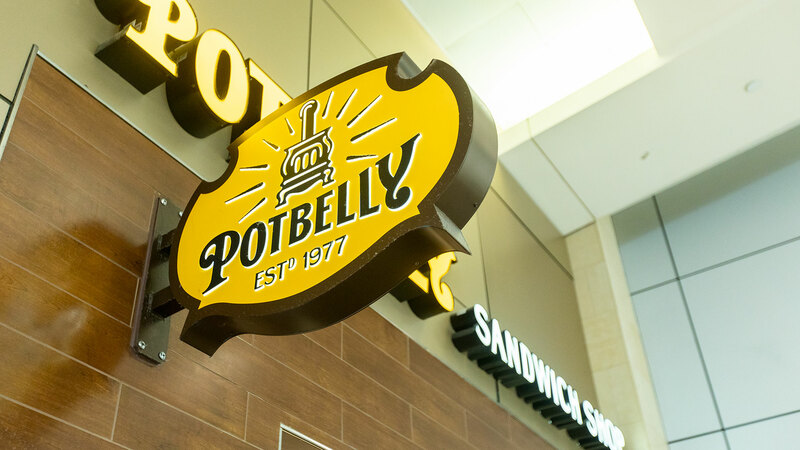 The only Potbelly’s Sandwich Works happens to be at Airside E inside TPA. Named after the infamous potbelly antique stove that graces in some form or fashion every branch of this sandwich shop, the popular Chicago eatery is serving hot subs for weary travelers. 3. Columbia named 5th best airport restaurant in the U.S. The famous Columbia Restaurant, yes, that Columbia Restaurant, the one named one of the most historic places to eat in the United States has a wonderful spot also in Airside E. The location just recently renovated their bar and also added a grab-and-go kiosk where they serve their famous 1905 salad. It was also named the 5th best airport restaurant in the country by the Daily Meal. In 2017, the airport began a $2 million investment in the public art exhibitions in TPA. 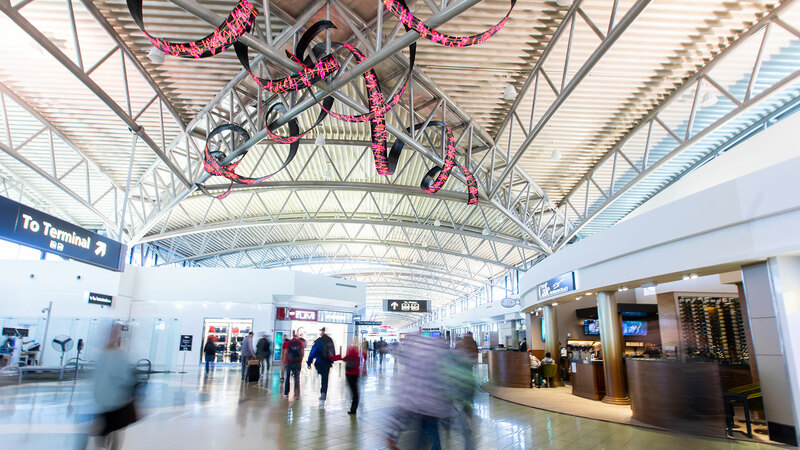 Daniel Canogar’s “Tendrils” – fashioned as ribbon-shaped LED screens – was one of the first exhibits and it hangs from the trusses of Airside F. Canogar’s ever-changing animated cadenza of Florida flowers and vines is inspired by nature’s resilience and permanence, according to the author’s website. 5. Cigar City was the first active airport brewery in the U.S.
A Tampa staple, Cigar City Brewing, has the first active airport brewery in the country. Yes, you read that right, they are brewing beers at the airport. In fact, Cigar City Brewing is making exclusive beers just for TPA travelers. Breakfast! Most every concession at the airport has a breakfast item and there are some gems from places that normally don’t serve breakfast at their regular locations like the BoNuts from PDQ (which is the only airport PDQ, by the way). Ahoy, the Gasparilla Bar. Yes, this pirate-themed bar is anchored at Airside F paying homage to our plundering history with lots of Captain Morgan. You can’t miss this one with a large mast, flags and lights hanging from weathered ropes. Spas, spas, spas. There is a Getaway Spa in every terminal of the airport. Airsides C and E offers full service where you can get massages, manicures, and pedicures in a relaxing environment before you jet off. Airsides A and F only offer massages. You can sign up for tours of Tampa International Airport. The guided tours will teach you about the storied history of TPA, its architecture, the public art program, airport security enhancements, and the Tampa Airport Marriott. Yes, you will get to visit all three levels of the main terminal. Tours are offered daily based on availability. Groups max out at 40. Don’t worry, these tours are free of charge. Click here to learn more about the TPA tours.